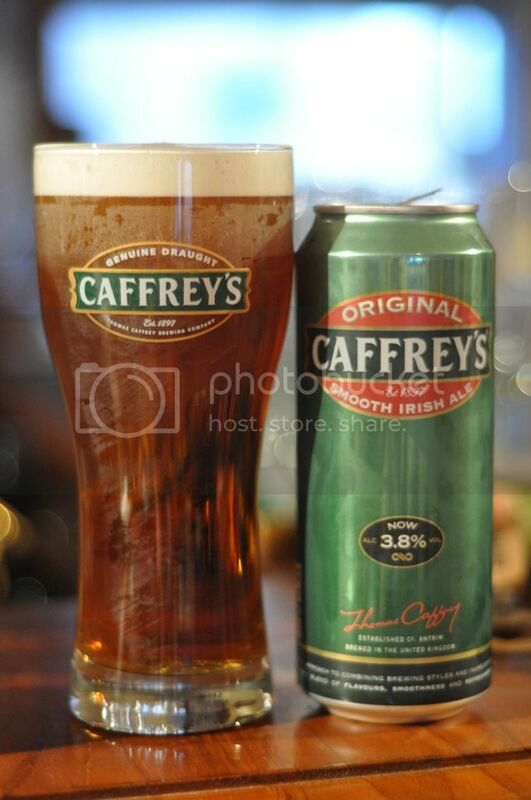 First and foremost thanks to Vince for the Caffrey's glass it's great! This beer has been brewed in Belfast for over 100 years, but is now also brewed in Burton-on-Trent in England after it's relaunch in 1994. I've never had this beer, so I'm looking forward to this! After the relaunch of this beer it had drastically improved sales in the United Kingdom and also gained a worldwide market for the first time. This was in no short part due to the new plan for the beer. It was designed so it could be served as cold as lager, its texture would be as smooth as a stout while keeping its taste of an ale. It's proved popular around 15 years ago, hopefully it's still good! My first impressions of this beer was a welcome shock, it's a surger can! I love surger cans! The surger can helps beers such as Guinness pour like they would on tap. The beer is a clear amber colour with a thick creamy head. The head has excellent retention, no doubt helped by the nitrogen agitation which comes with all surger cans, it also laces the glass well. There is no obvious carbonation, but in an ale that is not necessarily a bad thing. There isn't alot of different elements to the aroma of Caffrey's Original. The smell is mostly made up of sweet malts and caramels. I can also smell some fruit towards the end of the nose, I have a strange feeling that the fruit is pear, but not 100% on that. Anyway it smells quite nice, slightly sweet but not offensively so, quite nice overall. I'm a fan of the texture of this beer however the flavour leaves a little to be desired. The beer has a delicious creamy mouthfeel with very low carbonation. The flavour is a little lacking in inspiration and for my liking doesn't have enough substance to it. All elements of the smell are present in the beer but not in enough quantity. There is a sweetish taste to the beer and it finishes with a very minor bitter finish with hints of pear. Overall it's quite underwhelming. By no means is this a bad beer, it's just not one that I would go out of my way to get again. The flavours are nice, but the brewery just haven't been adventurous enough to get the most out of this beer. The concept of a beer that can be served as cold as a lager, have the texture of a stout (which it certainly does!) and the flavour of an ale is a noble one, if only this beer tasted like an ale. It's an interesting beer to try, however I'm not going to recommend it, it's just not that good!